There are dozens of options when it comes to finding stock photography online. And while there are plenty of great images out there, sourcing different photographers and images can become a logistical nightmare. Save yourself the headache and stick to one styled stock photography membership. Think you won’t need hundreds of photos? Think again! Between posting on instagram 1-2 times per day, all the content on your website, and making your blog and pinterest account look beautiful and cohesive, there are a LOT of images you’re going to need. Let’s look at the numbers. If you’re doing 1 blog post (with two photos) and 14 instagram posts per week (posting twice a day), that’s just a weekly need of 16 photos. Which makes 64 photos per month! Plus you’ll still need images for your website’s standard pages. If you’re going to pay per image, usually around $5-$25 per photo, that can add up very quickly. Before you know it, you’ll be spending hundreds or even thousands on stock photography. Investing in a stock photography membership, however, is a cost effective way to get beautiful, high-quality styled photos at a reasonable rate. The Styled Stock Society has a library with over 1,500 styled stock photos and new collections are released every month. For less than $200 per year, you’ll be able to have gorgeous on-brand images for all your needs without paying a huge fee. Paying per photo on a traditional stock photography website usually means you have to curate your favorite images, add to your cart, choose size options, make a payment, and then you can finally download. With a Styled Stock Society Membership you get instant access to over 1,500 gorgeous images with tons of variety – whether you’re looking for chic flatlays, lifestyle images, or mock-ups, the Styled Stock Society has several high-quality collections that are ready and waiting. 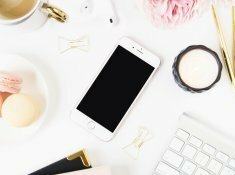 No matter where you’re working on your business and no matter what device you’re using, the Styled Stock Society membership comes with unlimited downloads. You don’t have to remember where you stored the images, you don’t have to stress about downloading before you’re ready to use them. Download chic styled stock photos from the membership site whenever and wherever it is convenient for you and your business. Trying to find consistency with pay-per-image websites can be tricky and time consuming. Different photographers have different styles, and all photographers edit their images in different ways. With a Styled Stock Society membership you get access to curated collections, all shot and edited in a uniform fashion, making building a consistent brand a breeze. Being able to build your brand with beautiful imagery and a consistent, cohesive look is an incredibly important part of running a business. The Styled Stock Society membership helps you style your brand without the headaches, thanks to a massive collection of gorgeous styled stock photos filled with chic image options to fit your brand. Styled Stock Society Members get exclusive access to over 1,500 high-quality styled stock photos!